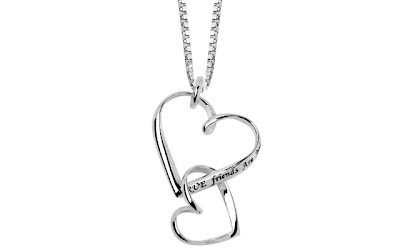 This Sterling Silver "True Friends Are Joined At The Heart" Double Heart Pendant 18" Necklace is currently selling for just $24.00 on Amazon.com! You will be saving 47% off the listed price of $45.00 with this jewelry deal. What a perfect friendship quote for this necklace design! Buy one for your best friend or sister and one for yourself. The pendant is approximately 1.5" tall.